The African lion is one of the fiercest creatures on planet Earth. Prowling the open savannas of Africa for thousands of years, these massive and powerful cats are symbolic of Africa’s vast, untamed spaces. These impressive beasts are captured perfectly on the 2015 1 oz Silver Burundi African Lion Coin, available now in near-perfect condition from Silver.com. Total mintage limited to just 50,000 coins! Issued a face value of 5000 Francs (Burundi) backed by the Republic of Burundi. 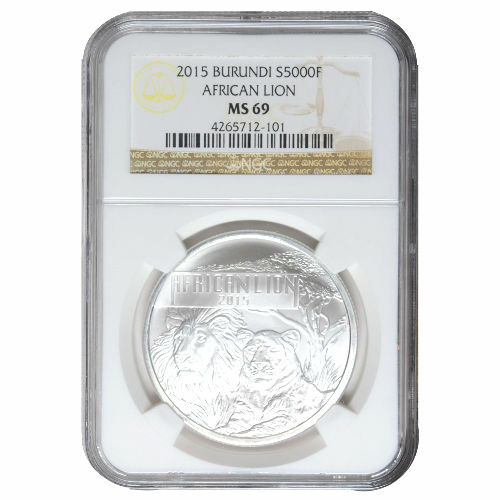 2015 1 oz Silver Burundi African Lion coins are the first in new series of sovereign coins for the nation of Burundi. The program calls for a new design feature on the obverse side of the coin each year, which means these coins have high collector’s value as the design sets are limited to one production year. Each of the coins in this product listing is available with an MS69 grade from the NGC. Near-perfect coins feature their full, original luster, and no more than two minor detracting flaws. These blemishes exist outside the primary focal areas of the coin, and often require magnification to see. If you have any questions about these products, a Silver.com associate is happy to help. You can reach our team members by calling us at 888-989-7223, connecting with us online through our live chat, or by sending us an email. 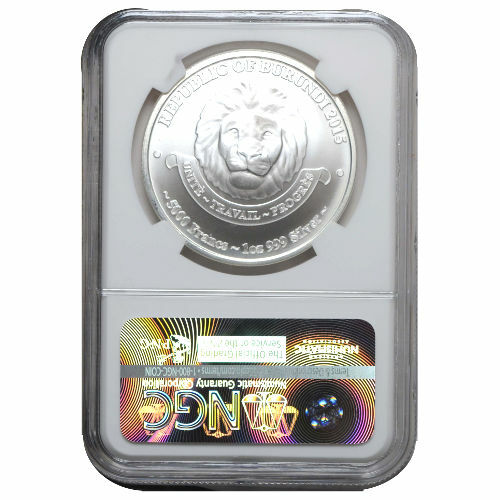 If you are interested in similar products, be sure to check out our full selection of Silver African Lion Coins.